So, as I went scouting for a good recipe for a fruit cake, this one from David Lebovitz's site caught my eye. Not your true-blue Christmas cake alright, but a chocolaty fruit cake, very promising with cocoa, bits of bittersweet chocolate, toasted nuts and a modest amount of dried fruit. No copious amounts of butter, even better! Dried sour cherries feature in Monsieur's recipe, I wanted to use dried cranberries and candied peel in place of the cherries, soaked the cranberries in water overnight. The next day, I had a guest coming over for lunch. Fairly satisfied that lunch was almost ready, I prepared the loaf pan, weighed the ingredients and kept the butter out to soften. An unexpected change in plans as I expect more people than planned! Panic, dump everything back in place, run around like a headless chicken! Finally, after all the clearing up in the evening, was ready to put up my feet, the temptation of a foot massage lurking in my mind , but the prepared tin looked even more tempting! I had to bake and was glad I did! The aroma of chocolate and orange in the warm cake was amazing! 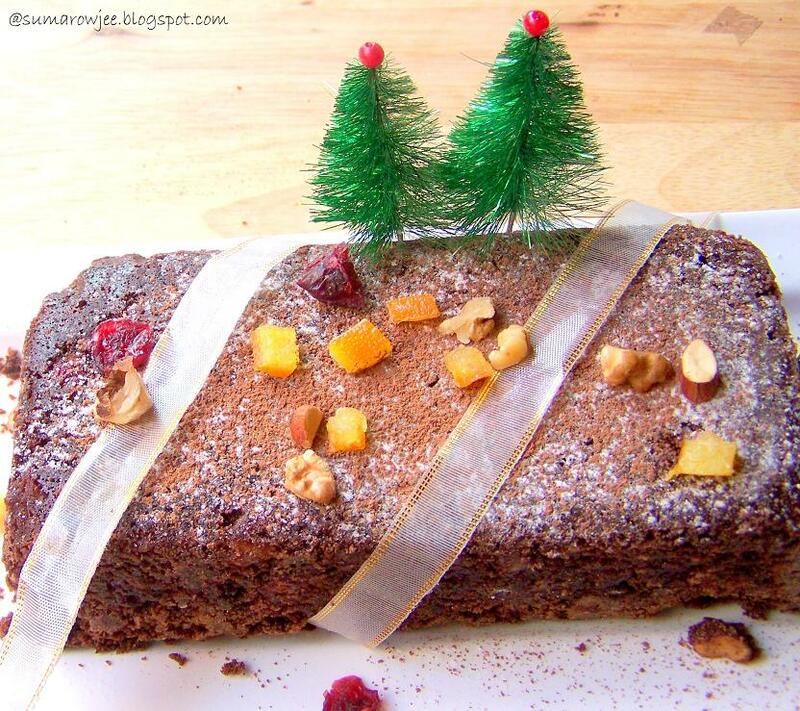 A stolen piece from the side of the warm loaf, chocolate, nuts and candied orange peel, yu...mm!!! David Lebovitz uses and recommends dried sour cherries. Dried pears, cranberries, candied ginger or apricots are other dried fruit you could use, macerating them overnight in rum, whiskey or amaretto for a day. If you are like me use just water or even orange juice if you prefer. Drain and squeeze out excess liquid. I have soaked dried cranberries in water overnight just to plump them. I have halved the recipe and baked in 2 small loaf pans. The cakes were light when warm, but turned dense but delicious as they cooled. Chop the cranberries and orange peel very well. Soak the cranberries in water overnight or for a few hours at least. Drain well, squeeze out excess liquid before use. If using liquor, a day or so before you make the cake, toss them in liquor, cover, and let macerate. On the day you bake the cakes, grease a 9 x5 inch (23 cm) loaf pan or smaller loaf pans and line the bottom with baking parchment. Preheat the oven to 180 degrees C / 350F. Sift together the flour, cocoa, salt, baking soda, and baking powder. Set aside. Stir together the egg, yolk, vanilla in a small bowl. You will need to dribble this into the butter and sugar as you cream. Using a fork, whisk in the orange zest into the buttermilk or yogurt. In the bowl of a standing electric mixer, or with a hand held mixer or by hand, dribbling in the egg mixture, beat the butter and sugar until very light and fluffy. I used my hand mixer on speed 3 for about 5 -6 minutes. Spoon the batter into the pan/pans ( filled a little more than half-full), bake for 45 minutes (for 9x5 pan, about 30-35 minutes for the smaller pans), or until a toothpick inserted into the center comes out clean. (Tricky, as your tester may have encountered a melting piece of chocolate and not uncooked batter). The cake is not a high riser. Let stand on the counter top for about 15 minutes. With a skewer, poke 50 holes in the cake and spoon 3 tablespoons of liquor over each cake. Let cool. For a boozy cake, he suggests poking holes in the warm cake with a skewer and brushing with liquor, brushing with additional liquor once in every few days for an even more boozy one! Storage: David Lebovitz says, if well wrapped, these cakes will last for about a week. If planning to freeze, don't add liquor. You can rewarm them once they’re thawed and add it later. Please note: I have used 1 cup of super fine sugar which weighed 180 grams. This was a wee bit on the sweeter side for me, though hubby and friends said it was just right. Bear in mind the kind of fruit (sweet or sour) you would be using and sweetness of juice if using any. Use bittersweet chocolate if you can find as it may help balance out the sweetness. 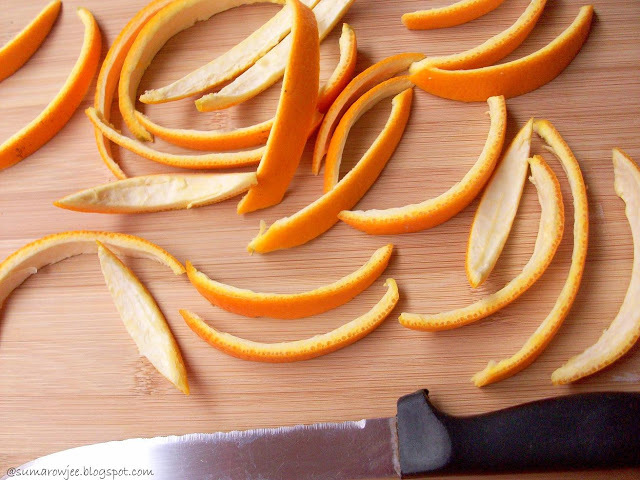 I have used a little more vanilla extract and some orange zest as I have not used any liquor. Thought I kept dreaming of neat slices of cake, the cake was quite crumbly with all the fruit and nuts and I could not manage a single neat slice! It dawns on me now, that probably if I had chopped the berries very well I would have been able to slice the cake.. The oddly cut slices were packed off for the neighbors, as I planned to bake another for the pictures. As my pictures tell you, the next one did not slice neatly either. We loved the cake, and maybe I will bake this just once more if I have any candied peel left. And may be sneak in and replace the pictures which look at least half as good as the cake tastes! Lovely cake Suma...I love love love fruit cakes and specially the ones wiith the candied orange peel....i love the citrusy, herby, fruity aromas when I bake the cake itself...I make an eggless version! Lovely clicks. That cake sounds really yum, since I forgot to soak the fruits till now, maybe I will make this for Christmas..
Looks so picture perfect!!! espescially with the cute christmas tree.. any pointers on how to make this EGGLESS? Delicious fruit cake Suma!! Mouthwatering!!! I love citrus flavours in my bakes. 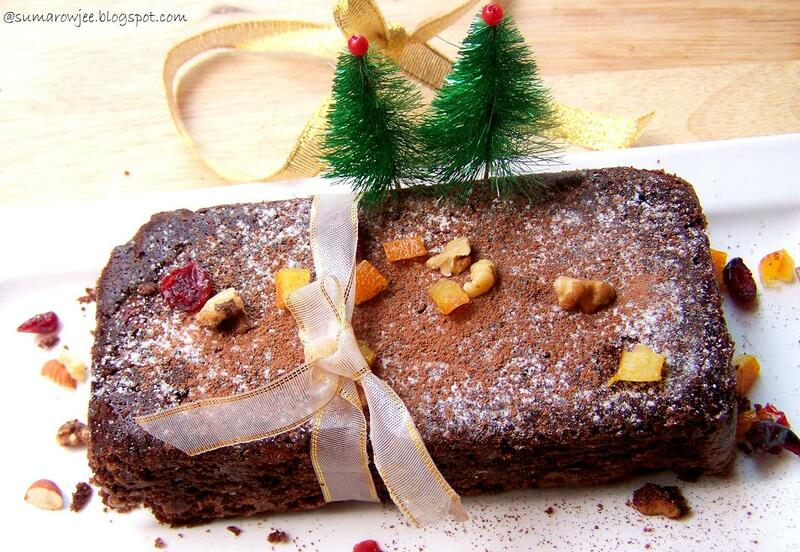 This chocolate fruit cake looks really delicious. Should give a try to this chocolate fruit cake, beautifully decorated prefect for the christmas season. 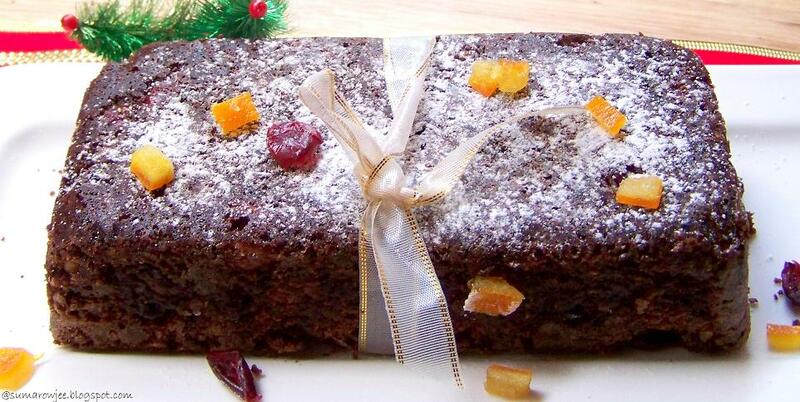 REally there are some people who hate fruit cakes !! 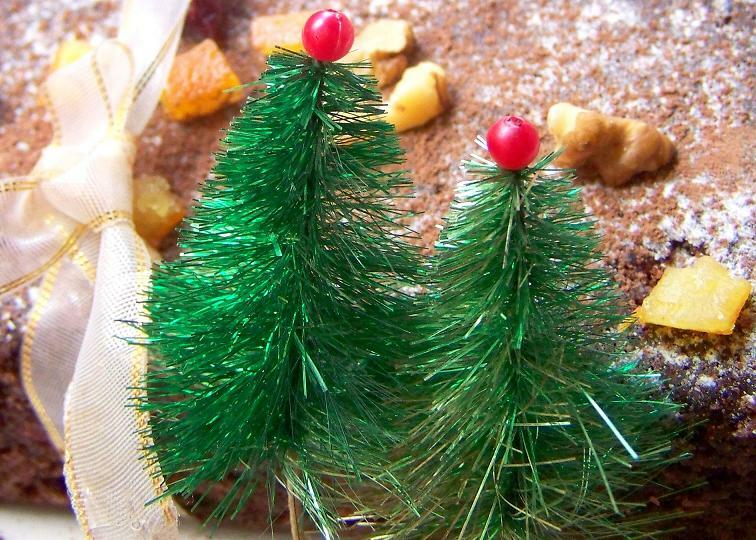 I love it...The cake looks perfect for the season..
PAt for the season - your blog is a delight to go through each time. Lovely looking cake! Delicious! Merry Christmas! Lovely looking cake. Amazing preparation.